Michael Wesch’s YouTube videos gave me the courage — and the ideas — to turn more and more of the responsibility for not just learning, but teaching, over to my students. Like most great educators, Wesch, associate professor of cultural anthropology at Kansas State University, is a great communicator. Fortunately for us, he is also a YouTube genius, so you don’t have to take my word for it — watch and hear him directly. Most of us first learned of him when his “The Machine is Us/ing Us” went viral 10 years ago, with more than 11 million views — a look at how the Web and hypertext were changing not just our ways of communicating, but our ways of thinking, as well. He also raised an issue that has come to the forefront most recently — as we use the Web, we are teaching it how to change us more effectively. He says he never intended to make a viral video, it was originally meant for his digital ethnography class. As remarkable as Dr. Wesch’s ability to use YouTube to communicate may be, his ideas about the reasons for empowering students to take the reins of their learning were what excited me the most. 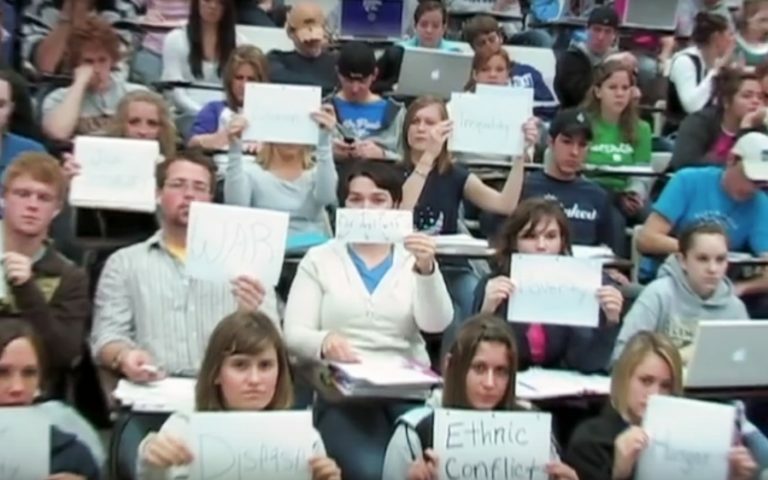 An old-school anthropologist who spent his summers in the highlands of New Guinea, Wesch pointed his students at their own culture, assigning graduate ethnography students to create “An Anthropological Introduction to YouTube.” Remember that video of students in a large lecture hall, telling us about their lives by holding up cards? That was Wesch — or rather, his students — presenting “A Vision of Students Today.” Saying “we’re trying to help them make a life worth living, and that can’t just be taught and given a letter grade,” Wesch assigned his students to live in an assisted living community. Wesch’s work has been an inspiration to educators as well as to students. I required students in my Stanford course on “Social Media Issues” to view his video, “A Portal to Media Literacy,” to understand what I meant when I told them that I would give them some of my teacher power and, in return, ask them to take more responsibility for their learning. When I had the opportunity to help select education all-stars to help plan a MOOC on “Connected Courses,” Mike Wesch was first on my list. Our planning group met for one of the most inspiring weeks of my life on the campus of UC Irvine. Wesch electrified us with his talk on why educators should start with their “why?” educate before thinking about how to educate. We included that video as one of the texts in the first module of the online course. Now Wesch is planning a free online course on “The Art of Being Human” for the summer of 2017– anthropology for everyone. To Wesch, anthropology is not just a social science and an academic discipline. As he declares in the name of his course, anthropology is about learning to be human. He is in the process of creating a free online multimedia textbook. Watch my recent video interview with Wesch and change how you think about teaching, learning and being human.